– Backup iPhone/iPod/iPad SMS & iMessage & MMS (including attached photos, audios, videos, and other attachments) to MAC in exactly the same way the messages appear on your iPhone. – Print SMS & MMS & iMessage out and have them be seperated by date and ‘sender’ and ‘receiver’. – Extract & Recover SMS & iMessage & MMS & from iTunes Backup file. – Retrieve Deleted Messages Directly from iPhone/iPad/iPod. Wondershare SignX is, by no doubt, the best application that can be used to electronically sign documents. It is fast and has a very good interface that makes it easy for users to navigate through it. SignX has a list of features that makes it a perfect choice for any business or institution that would like to incorporate the electronic signature. Quick, simple and reliable software to export OST to PST,EML,EMLX,MSG,MBOX,VCF,MSG and many other formats. Convert HEIF (.heic) images to JPEGs in one go. Support mutiple convert. Starting with Apple’s latest iOS 11, HEIC is the new standard format for storing images on iDevices. Compared with JPEG, this high efficiency format makes images much smaller without sacrificing quality. With Tansee HEIC converter, you can convert HEIF (.heic) images to JPEGs easily. The quality of the image will not be compromised. The “Reservation Widget” allows your website visitors to book a room at your hotel directly from 3rd party websites. That means that the widget can be integrated to the third party website as a widget and will be part of the third party website’s DOM. This widget provides quick and easy booking and reservation-setting options for your website users. By integrating this widget on your or other websites (3rd party sites) with it’s powerful set of features, you can benefit from management of bookings, reservations, leads generation etc. With an intuitive step by step reservation process, reservation process will be a breeze for your users.. Our reservations widgets can be used by hotels and tourism operators of all types (apartment bookings, condo reservations, villa rentals, activities, car rentals, tour reservations, etc.). They can be customized for each of yuor websites, giving travelers a consistent experience while offering advanced shopping services including interactive quotes, reservations, bookings, lead generation and direct marketing. White labeled solution A white labeled solution is a very important part of any product and allows it to be integrated into any existing web site without any existing code change in the web site by adding the additional chunk of code for the widget. The uHotelBooking also has the white labeled solution that can be integrated into any third party website and its web?platform independent, i.e. the booking engine is coded in PHP, but can be integrated to any website written in .NET, JSP or any other server or client scripting language. Ashampoo Video Optimizer Pro is a powerful solution to enhance the quality of your videos. Contrast, color and white balance optimization improves video quality while automatic deshaking, common in cellphone and action cam footage, stabilizes your videos. Your clips will look sharper with less noise and less flicker usually caused by poor lighting. Ashampoo Video Optimizer Pro also fixes lens distortions like the dreaded fisheyes and comes with multiple camera presets for popular models. Video playback features custom speeds for slow motion and time-lapse effects. Video effects like tilt shift add more individuality to your clips while text and comment overlays help get your point across. The program also supports video editing to crop, rotate, cut or merge your video clips. 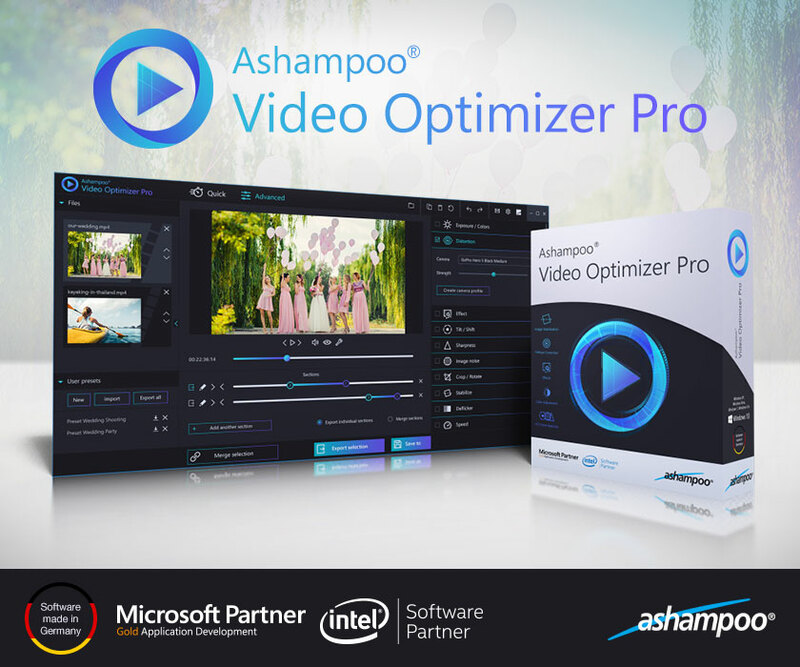 Ashampoo Video Optimizer Pro is the ideal blend of video editor and video optimizer to enhance and improve the quality of your videos through a logical and intuitive user interface with batch processing for huge time savings.